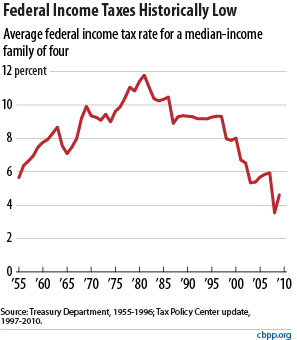 "Middle-income Americans are now paying federal taxes at or near historically low levels". "A family of four in the exact middle of the income spectrum will pay only 4.6 percent of its income in federal income taxes this year, according to [the]Tax Policy Center. This is the second-lowest percentage in the past 50 years." Of course the trend on the graph does seem to be rising for the past few years. Then according to the graph the Tea Baggers must be correct and the Average American is paying more taxes as FOX and the GOP have been telling us. Forgive me Rupert for doubting you! The federal taxes may be low, for now, but Obama has committed us to much, much higher taxes for the next ten years. And sales taxes have risen, state taxes have or will rise, "fee-type" taxes (transfer taxes on real estate and the like) have shot up through the roof.